From Gettysburg to Bar Harbor, Maine, we knew we’d need to make a couple of stops to break up the driving. 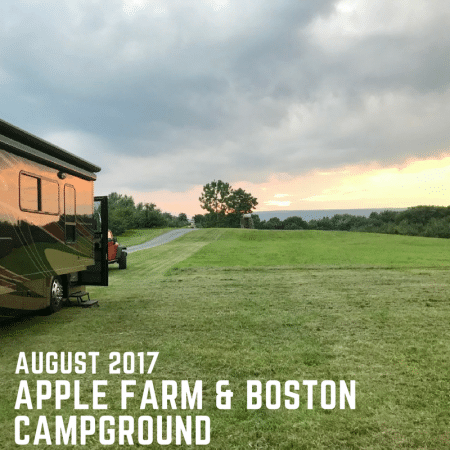 So we decided to use our membership in Harvest Hosts to stay over night in an Apple Orchard in New York, and booked a campground near Boston for the second night. 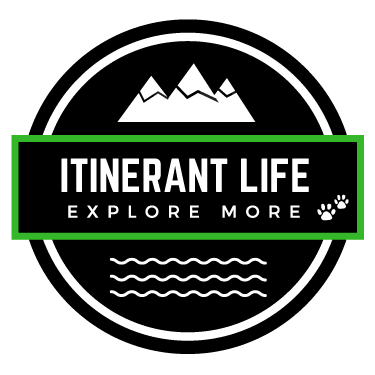 If you’re an RVer, we can’t express enough how awesome this membership is! We get to stay in farms, wineries, orchards and other places that have a little piece of land they’re willing to allow RVers to stay on for free, overnight (mostly). All we do is make sure we buy something from them if they’re selling anything. Our first stop – an apple farm in New York. The entrance was a little rough – we scraped our butts a bit on the entrance, but nothing too damaging. We were greeted by the farm owner, and taken up in to the orchard itself to park. How cool is that! Up among the apple trees. We parked, and cooked a meal and enjoyed a thunderstorm from inside our RV, all while being surrounded by apples. Lots and lots of apples. Just 30 miles northwest of Boston , in the little town of Littleton, Massachusetts, is a really cute campground called Boston Minute Man. I’ve got to be honest, I didn’t expect a lot from this campground. I guess because it was closish to Boston and likely to be really busy, oh and they didn’t have online reservations! But we were really pleasantly surprised when we arrived and were taken to our site. It is set in amongst a forest of pine trees, and even though it was raining the whole time we were there, it was a gorgeous setting for us to spend a night. Oh, and the dogs had a great time at Minute Man Campground! They had a gorgeous dog park there – fully fenced, with benches for us to sit on. It was shady and the ground was nice and soft, with plenty of trees to use (for Sidney). They got to have a great run off leash which is always a treat for them when we’re traveling! Overall, we loved it and would come back here if we were swinging through the area again. Next up? Boston to Bar Harbor, Maine! Blogging can be frustrating because you sometimes feel like people are not reading — but we are! Another wonderful update and it’s really nice to be able to keep up with your adventures like this. I’m in California (at John C.’s place in Sausalito) and then in about 10 days back to Nebraska the long way around… I’m driving the coast highway all the way to Canada via Oregon and Washington and then onward through the Canadian Rockies… I then make a right at North Dakota and get back home that way. Keep up the posts… They are very nicely done and appreciated. Hi Bob! Thank you! We appreciate you reading and the encouragement to continue doing so 🙂 John was wondering about John C. so we’re glad you’re still in touch. Your journey home sounds awesome, but cold!! I hope the snow holds off for you. John S. said he apologies for not having replied to your emails yet, but he will! Thanks again Bob.